Climate change poses a growing threat across European Union society – at the nexus of water and energy resource availability and use in particular. Warming water temperatures and reduced river flows will make thermal coal and nuclear, as well as hydro power, plants vulnerable to rising costs, reduced availability and decreasing output, according to long-term study published by the International Institute of Applied Systems Analysis (IIASA). Wholesale electricity prices will rise in most EU countries as a result relative to that during 1971-2000, the research team concludes. The highest increases will occur in Slovenia (12%-15%), Bulgaria (21%-23%) and Romania (31-32%). Increased water availability in Sweden and Norway, in contrast, will result in lower annual price averages as lower cost hydro power pushes out more expensive thermal coal, natural gas and nuclear power generation, they anticipate. Replacement of coal-fired power plants by more expensive natural gas plants is also expected to contribute to rising wholesale power costs, according to the report authors. Hydro power accounted for 10 percent of total electricity consumption and around 80 percent of electricity generated from renewable sources in Europe in 2006, according to the European Commission (EC). In addition to the direct use of water to generate electricity, thermal coal and nuclear power plants also make use of a large share of the region’s water resources for cooling purposes. “On average, 44 percent of total water abstraction in Europe is used for agriculture, 40% for industry and energy production (cooling in power plants), and 15 percent for public water supply,” according to the European Environment Agency (EEA). The vast bulk of Europe’s hydropower comes from large-scale hydroelectric plants: some 16,800 small hydropower plants installed in the EU-27 had a total capacity of 11 gigawatts (GW) accounted for about 3% of total electricity generation, according to the European Small Hydropower Association (ESHA). There’s not much water left to squeeze. The EC estimates that more than 82 percent of all economically feasible small hydropower (SHP) potential has been exploited in the former EU-15. In contrast, the SHP exploitation rate is much lower in EU-10, less than half that of the EU-15. It’s also very small, around 6 percent, in EU Candidate Countries, according to the EC. Those countries with the highest SHP potential include Italy, France and Spain, along with Poland and the Czech Republic. These are among the countries where climate change poses the greatest threat to water resources and power plants, however, according to the study. Moreover, thermal coal and nuclear, as well as hydropower plants, are vulnerable to a warming climate. 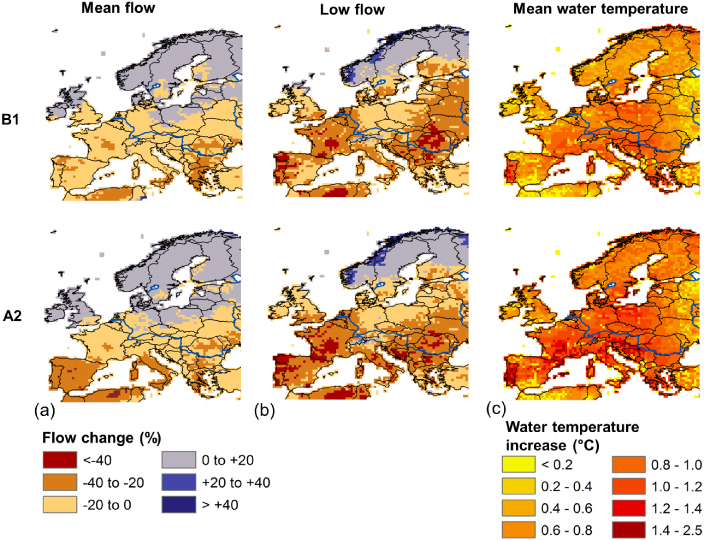 In their study, the researchers conclude that “the combination of increased water temperatures and reduced summer river flow under climate change is likely to affect both hydropower and thermoelectric power generating capacity in Europe, with distinct impacts on electricity prices. “Useable capacity of thermoelectric power is expected to be most strongly impacted in countries in the central, southern and south-eastern part of Europe, where strong declines in low summer river flow are projected in combination with large increases in water temperature. This is expected to increase environmental restrictions on cooling water uses, and can result in substantial reductions in power plant capacities during summer (up to 16–20 percent for Bulgaria and 15–21 percent for Spain for 2031–2060). The researchers recommend the EU take several proactive steps to prevent or at least alleviate what appears to be a looming decline in water resource availability. The climate change adaptation steps they recommend include retrofitting or replacing existing thermal coal and nuclear power plants and diversifying the EU’s energy mix by relying more on renewable energy resources that are not dependent water availability and water temperature. “Considering the high shares of hydro power, coal-fueled and nuclear-fueled power plants in most European countries, the vulnerability to declines in summer river flow and increased water temperatures can be high,” they wrote. “Planned adaptation strategies are therefore highly recommended, especially in the southern, central and south-eastern parts of Europe, where overall largest impacts on thermoelectric and hydro power generating capacity are projected under climate change. Considering the high investments costs (EPRI 2011), retrofitting or replacement of power plants might not be beneficial from the perspective of individual power plant operators, although the social benefits of adaptation could be substantial.